Enter the BMC. Their campaign to #MendOurMountains has been launched to raise the necessary funds to restore and protect some of the worst eroded and heavily used areas. I joined them earlier this week to highlight the issues on the Great Ridge and make a huge statement that something needs to change. It had been another warm day and my 1977 VW Kamper complained as we climbed the Winnats Pass. Smoke billowed from the heater vents and a burning oily smell filled the cab. Some of you might be horrified at this, but this is normal in a 40-year-old, air-cooled Dub. I pulled into the car park at Mam Nick and caught up with a number of friends from both the outdoors and Buxton Mountain Rescue. I had been asked to be a senior marshal and keep the hundreds of volunteers safe, in line and facing the right way for the all-important photographs. After a short briefing, we led out across the ridge and I stationed myself against the base of Back Tor. My friend Paul sat just under the top, keeping out of the wind and between us, we kept the line in shape. The sun was setting and a beautiful peace filled the air. 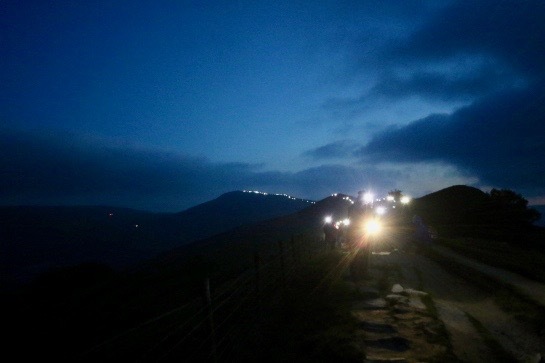 Lights galore began to stream out across the ridge as a stiff and chilling breeze rose, which highlighted the erosion problems as dust from the path blew through the crowds. One volunteer complained that he had frostbite, until I showed him my hands..! 600 volunteers were placed every few yards to illuminate all the contours of the ridge. There were plenty of smiles and laughter filled the air, but the wind-chill was having its effect. A thick and threatening cloud began to fall into the Vale of Edale, which tested the photographers nerves, but the call came over the radio and we faced towards the lenses for the all-important shots. Before me stood a long line of beaming torches, which lit up the ridge like a Christmas decoration. Like summiting a mountain, many events take months to plan, yet the crescendo of their work only takes minutes to execute. The call came that the shots had been taken and everyone was thanked for their efforts. There were plenty of cold limbs, but smiles too as the crowds left the ridge in droves and headed like starlit snakes down to Castleton. I wandered back with Paul and warmed what was left of my hands and feet. My Van had cooled down and I sat in her, easing the boots from whats left of my throbbing feet. I’ve been on them a lot lately and really should put them up, but I’m not a man for sitting down. We all have a responsibility to protect our countryside. If we do not, then the amount of long-term damage caused will take generations to recover. To enjoy the fresh air and peace, sometimes we must pay. Sorry I didn’t make it pal,had a busy two days first to mach loop in Wales then Waddington,Coningsby,and East Kirby . See you soon. Nice write up as always Nigel. This ridge is one of my favourites. I was up on Kinder on Monday and was surprised just how much work had been done there. I always pick up bits of rubbish from any walk I do and ensure I leave nothing behind. Well done to everyone involved. Long may we enjoy the freedom of the glorious Peak District.